Luxury resorts on the unrivaled Grace Bay Beach. 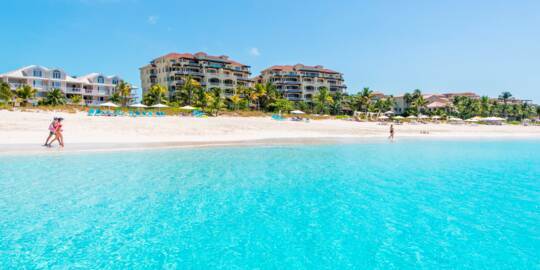 Seven Stars resort on Grace Bay Beach. 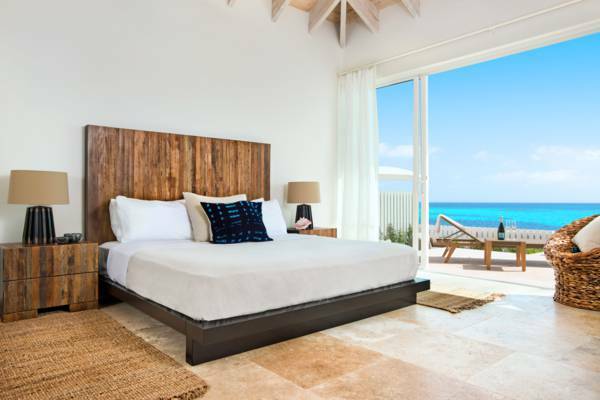 The Turks and Caicos is home to an incredible range of resorts and accommodations, and this guide will help you find the perfect place to stay in paradise. 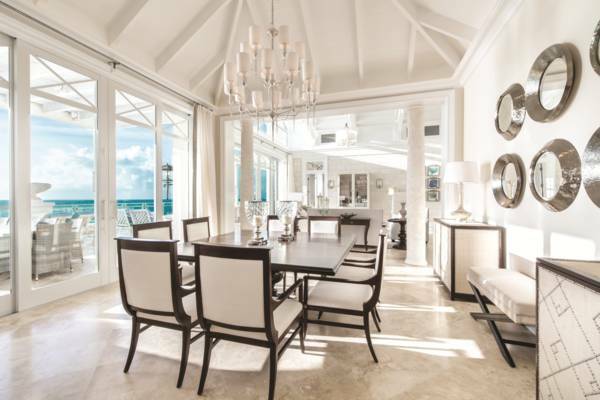 Accommodations in the Turks and Caicos are generally divided into one of three categories: resorts and hotels, all-inclusive resorts, and rental villas and guest houses. 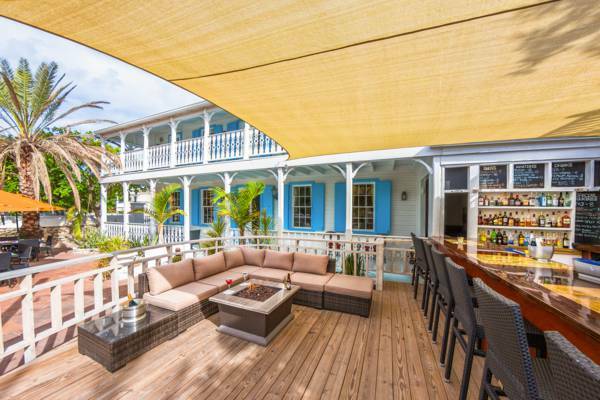 See Turks and Caicos Accommodations for overviews of what each accommodation type offers. A great place to start in the quest for the perfect Turks and Caicos resort is to decide which of our islands is right for you. Each of our inhabited islands offers a widely ranging array of atmosphere, attractions, and dining. If you’re visiting the Turks and Caicos for a specific activity or ambience, you’ll typically have the best experience if you choose the right destination. There’s also an incredible range of beaches to discover from in Turks and Caicos, all of which feature spectacular turquoise waters and sugar-soft white sand. The penthouse at the Shore Club Resort on Long Bay Beach. Providenciales is the undisputed leader of luxury tourism in the Turks and Caicos, and now hosts the majority of the development in the country. All of the large all-inclusive resorts are on this island as well. Crowning Providenciales is the unparalleled Grace Bay Beach, consistently voted one of the best beaches in the world. If you’re seeking spectacular beaches, gourmet dining, luxury amenities, and shopping, Providenciales is likely a better choice than our other islands. The country’s only 18 hole golf course, the top-rated Provo Golf Club, is on Providenciales as well. Providenciales also supports vibrant scuba diving. An unrivalled system of barrier reef is within access and spans over 80 miles of the marine plateau edge from North Caicos to French Cay. Many of the country’s best dive sites are found in this system, yet the boat rides out may be as long as an hour each way. There’s also a great selection of water sports. 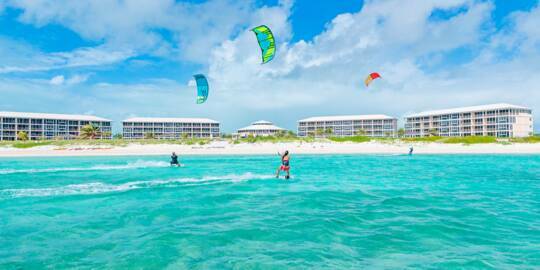 Most of the parasail, boat charter, jet ski, wakeboarding and kayaking tour companies are based on Providenciales. Nearly all of the larger luxury resorts on the island are found on the world famous Grace Bay Beach or the Bight Beach. The top resorts on Providenciales each bring a unique aspect. Sandal’s Beaches Turks and Caicos offers an unparalleled array of activities and attractions for kids of all ages. Grace Bay Club, Gansevoort, Le Vele, and The Shore Club bring elegance and luxury. The remote and exclusive Amanyara combines luxury with seclusion in an exquisite national park environment. The bar and courtyard at the Turks Head Inne on Grand Turk. There are some great budget-oriented options as well, both on the beach and inland. Ports of Call Resort is centrally located in the Grace Bay tourism region yet is within easy walking distance of the beach. Ocean Club West and the Alexandra Resort are beachfront and offer great rates. Prior to the 1990s, Grand Turk was the centre of activity in the Turks and Caicos. The nation’s capital city of Cockburn Town is found here, and is a picturesque British Colonial beachfront settlement. Today, Grand Turk welcomes large numbers of cruise ship guests, yet overnight stays have remained low in number over the years, and most accommodations are quaint and tranquil villa and guest house rentals. There are a couple small resorts and hotels to choose from as well. The small yet select Bohio Dive Resort is situated on the best section of the popular Pillory Beach and offers a perfect combination of amenities, gourmet dining, and of course stellar scuba diving. Several inns and hotels are found on the quiet Queen Street and Duke Street in Cockburn Town. There’s the beachfront Osprey Beach Hotel, the classic Salt Raker Inn, and the Turks Head Inne, all of which provide an unforgettable atmosphere of time past. Grand Turk is a great scuba diving destination. Not only are the reefs exquisite, most dive sites are only a short boat trip out. The view from the bedroom at the Sail Rock Resort on South Caicos. 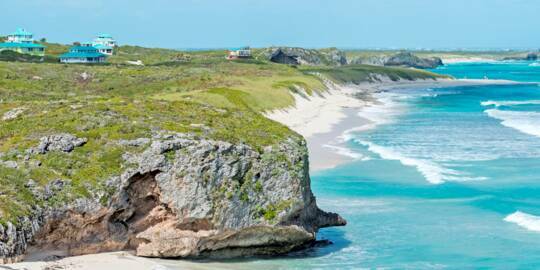 A newcomer to the tourism arena is South Caicos, which has recently welcomed two luxury resorts; the East Bay Resort and Sailrock. These exclusive resorts are ideal choices for those looking for something off the beaten track, and avid flats and bone fishers. Parrot Cay and Pine Cay, two small and beautiful private islands that are found between Providenciales and North Caicos, each have a single luxury resort. Both of these exclusive resorts have hosted an impressive repertoire of celebrities and heads of state. The COMO Parrot Cay Resort offers everything that would be expected of a luxury retreat. There are several restaurants, a spa, water sports amenities, and full butler and concierge services. The accommodation choices range from resort rooms and suites, to stand-alone villas that are managed by the resort. Meridian Club on Pine Cay is an interesting luxury resort, and due to its low-key nature is often overlooked. Pine Cay is a very quiet island, and this small accommodation complements the ambience of this laid-back tropical getaway perfectly. The water park and attractions at Beaches Resort. The things to do both in and off the resort should factor into accommodation and island selection. 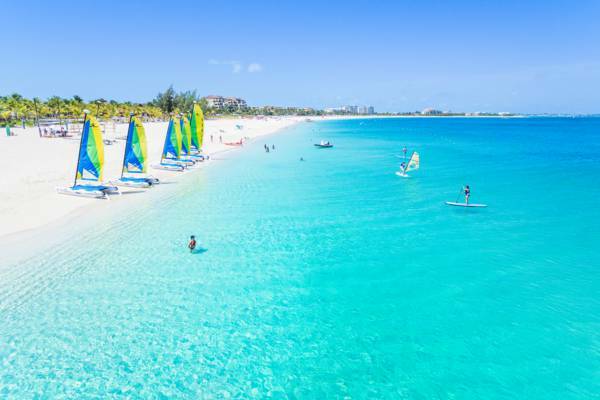 Most luxury hotels in the Turks and Caicos, regardless of whether they are all inclusive or not, maintain an array of non-powered water sports equipment for guest use, such as kayaks, paddle boards, Hobie Cat sailboats, and snorkel gear. Unlike some other Caribbean destinations, most of the accommodations in the Turks and Caicos are family and kid friendly, be it resort or luxury villa. Our pristine beaches and marine environment are of course a primary attraction for all ages, and the things to do at local resorts revolve around the beach, boat charters, water sports and snorkelling tours. 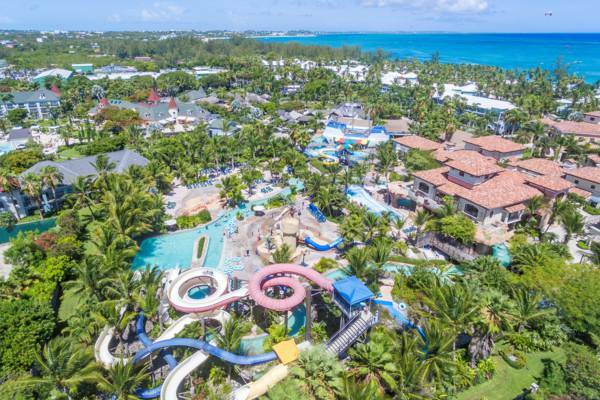 Sandal’s Beaches all-inclusive is the only resort that breaks the mould, with an impressive collection of amenities, attractions and even restaurants that are especially geared towards children. There’s a waterpark with a pirate ship, game arcades, and Sesame Street live entertainment. Water sports at the Club Med all-inclusive. Currently, there’s only oTurks and Caicos resort with an adults only guest policy: Club Med Turkoise. This expansive all-inclusive is the oldest still-operating resort in the Turks and Caicos, and was a catalyst in the introduction of the tourism industry on Providenciales in the 1980s. Club Med offers a great selection of water sports amenities and attractions. There are Hobie cat sailboats, kayaks, stand up paddle boards, windsurfers, scuba diving and snorkelling trips, and some great land sports as well. In some cases, a great way to save on vacation expenses is to select a package accommodation deal. These offers may be created by local resorts, local booking companies, or one of the international booking companies such as Expedia or Booking.com, and include the room, airfare, and a rental car. Packages can save you quite a bit, yet just as often as not actually may not be the least expensive option. For the best Turks and Caicos resort rates, it’s generally best to check with your chosen accommodation directly, as they’ll often be able to save on third-party booking site commissions, which they’re often happy to share with you the guest, either in the way of extras such as discount car rentals, a free night or two, or directly with lower room rates. As is common in the Caribbean, the Turks and Caicos experiences predictable rises and falls in tourist arrivals according to the time of year, with the winter “high season” months being the busiest and the end of summer and the fall “low season” having the lowest rates and greatest availability. To encourage bookings, Turks and Caicos resorts often have special offers during the low season, with rates that may be as much as half off the typical price. See Best Times to Visit and Budget Vacation Planning for more information. Before booking, contact your chosen accommodation directly and see what rate and complimentary extras they’ll offer. Due to their not having to pay third-party commissions, the direct hotel rate is typically the lowest. What are the cancellation or date change policies and fees of the package? In some packages these may be onerous. If you’d rather book a package vacation that doesn’t require the research and time investment of booking on your own, consider working with one of the established local booking companies. There are few such businesses, and they’ll go above and beyond to fix any problems that arise. Avid scuba divers may be best served with a local resort deal, which can save a significant amount. 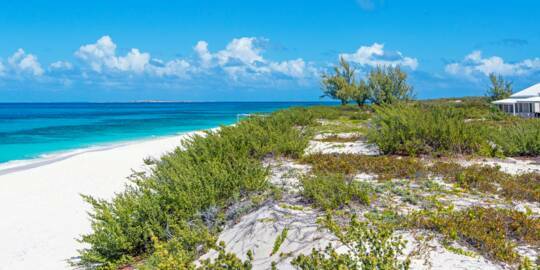 Such deals are available on Providenciales, Grand Turk, and Salt Cay. Nearly all hotels and resorts in Turks and Caicos offer a minimum of typical amenities, including a pool, beach loungers, fitness and business centre, and a restaurant and bar. The larger accommodations often include some extra amenities for guest to enjoy, such as Hobie Cat sailboats, ocean kayaks and stand up paddle boards. 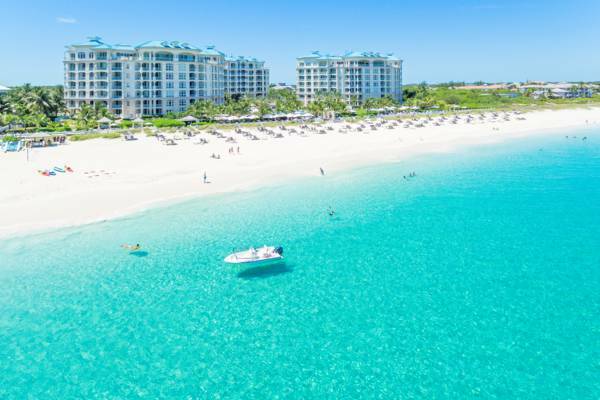 The Turks and Caicos all-inclusive resorts of course bring a bit more in the way of complimentary amenities, with wider dining and restaurant options, spas, and in some cases free boat and snorkelling cruises.